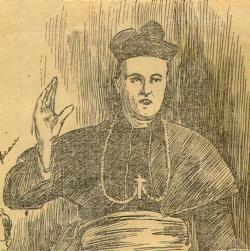 Brother Pompian, known affectionately to his students as "Brother Sub," entered the Christian Brothers in Montreal in May 1856. He arrived in Buffalo on September 1, 1861, to be the sub-director of St. Joseph's College, and was named director of the school in 1880, before being reassigned to Manhattan College in 1889. St. Joseph's College experienced financial hardship in 1891 and closed its doors for two years. Attempts to become re-established in the Buffalo community following its two-year closure would not be effective until Brother Pompian returned to lead the school. Brother Pompian returned to the position of director in 1896 and can be credited with acquiring property in downtown Buffalo where the new St. Joseph's Collegiate Institute would be established at 1238 Main Street in 1900. Under the steady direction of Brother Pompian, the school would expand its enrollment and continue its reputation of academic excellence in the Buffalo area at that location until its eventual move to Kenmore Avenue in the 1950s. Quotes taken from articles published in the early 20th Century reveal the character of Brother Pompian and demonstrate the respect that the St. Joseph's community accorded to Brother "Sub." "The classroom was his place of pleasure. No effort was too great in behalf of his boys, as he lovingly called his pupils. School hours did not close for him at the sound of the bell for dismissal. All who had difficulties in their studies would approach without hesitation and found Brother Pompian only too eager to assist them. In fact, the pupils seemed loath to leave. There was no hurrying away from his presence, no eagerness to depart. He possessed a charm of character that drew everyone to him. There was an indefinable something about him that spurred his pupils on to their best efforts. He will always be remembered as a most successful teacher." "His influence went beyond the confines of his classroom and from the abundance of his mind and heart he enriched many. His wise counsel often saved while his example always inspired. His was the resolution of a strong mind, coupled with the acute sensitiveness of the natural teacher...Eager and enthusiastic himself in the pursuit of knowledge, he inspired his zeal to the pupils who gathered around him." "'We have amongst us one who speaks but little outside of the class room. His superiors have chosen him to re-establish St. Joseph's College. No one in this city today is better known, better loved, than Brother Pompian.' At the mention of the brother's name, the students rose en masse and cheered lustily. The Bishop continued: 'If there is any one here I love, it is him who taught me in my younger days. Now when I am placed in this exalted position, I am pleased to know that I will have so good a man to labor with as old Brother Sub.'" "So long life to Brother Sub. And may he live to enroll among his pupils not only grandchildren, but great grandchildren as well of former pupils. We wish we could hope for him immortality on this earth that he might preserve to further students the type of perfect Christian gentlemen."